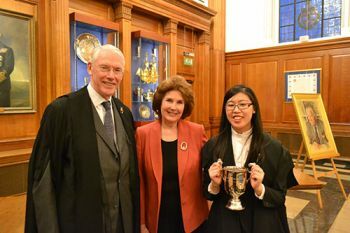 Students from The City Law School gave an impressive performance in their quest for the Inner Temple Debating Society’s Rawlinson Cup on 11th May. 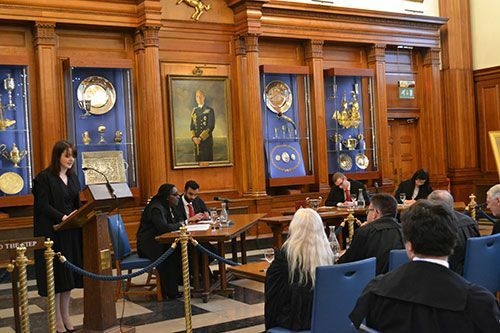 Three City students - Emma Lui, Rachel Owusu-Agyei, Gayan Samarasinghe- and Alexander Matthews (from BPP) were finalists in the prestigious Inner Temple Debating Society Rawlinson Cup for Debating, which took place on 11th May before a capacity audience. Emma Lui carried off the coveted Cup. The Inner Temple Debating Society President, Belize Harrison, gave a feisty introductory speech before the competitors began. London’s Inns of Court are a group of four institutions of considerable antiquity that have historically been responsible for legal education. Their respective governing bodies, the Benches, exercise the exclusive right of admitting persons to practice by a formal call to the bar. They consist of the Inner Temple and Middle Temple (both housed within the area known as The Temple), Lincoln’s Inn and Gray’s Inn - all of which are located in the general vicinity of the Royal Courts of Justice, at the boundary between the City of London and Westminster.